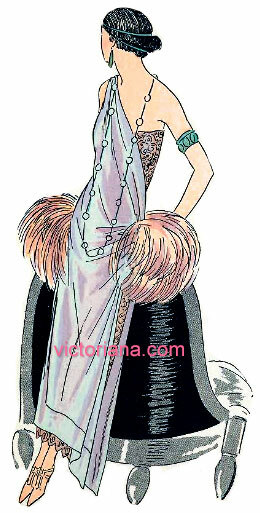 Downton Abbey fans are introduced to the flapper craze of the 1920s. Downton Abbey fans are introduced to the flapper craze of the 1920s. In the fourth season of the popular period drama, the typically reserved Lady Edith Crawley has embraced the glamorous and “shocking” fashions of the 1920s flapper. We see a daring transformation of the normally dowdy aristocrat as she parties in shoulder-baring and ankle flashing evening gowns. When Lady Edith chose her evening frocks, it wasn’t from ordinary clothing establishments. She assuredly was reading publications such as Gazette du Bon Ton, which catered exclusively to the wealthy. This French publication provided exquisite fashion plates created by contemporary artists such as Paul Iribe, George Lepape, Georges Barbier, Charles Martin and others. Marketed towards privileged shoppers, prints of exclusive and trend-setting 1920 fashions appeared in limited editions. Many designs were romanticized leisure scenes of the well-to-do, illustrating the latest creations of Paris fashion houses such as Worth, Lanvin, Doucet, Poiret, Callot Soeurs, Paquin and Beers. In 1922 (the setting for the fourth season of Downton Abbey), Gazette du Bon Ton featured several sketches of “Robes a Danser” (dancing dresses). These designs were glamorous and chic, stylish and “modern”, the perfect style for the 1920s flapper (and the evolving Lady Edith). The featured evening dresses, inspired by the costumes of “femmes de couleur de l’Afrique Centrale” (women of color of central Africa), are similar to the designs worn by Lady Edith in recent episodes. See all five dresses here. Examples of 1920 fashion including descriptions and prices are featured in this 1920s clothing catalog. You can see him again in a new just-released period drama. Showcased at Biltmore House - which bears a striking resemblance to Highclere Castle.